Classic piece of lab equipment, used for combustion, sterilisation and heating. 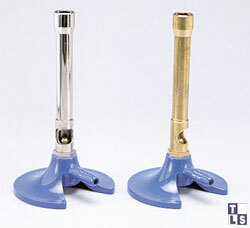 The Bunsen burner is a classic and instantly recognisable piece of lab apparatus. It consists of a base plate with connector for gas piping, adjustable collar and barrel. The collar is adjustable so that different types of flame are achievable. The hole in the collar allows air to be drawn into the barrel, mixing with the gas to produce a hotter flame. If the collar is adjusted so that the hole is closed, the air can only mix with the gas at the point where is combusts, producing a bright yellow flame. This is sometimes referred to as the 'safety flame'. When lighting a bunsen burner, the hole should always be closed as the gas is not only easier to light but because of the bright flame, is easier to see in ambient light. The yellow flame is brighter because of small soot particles in the flame which are heated to incandescence. 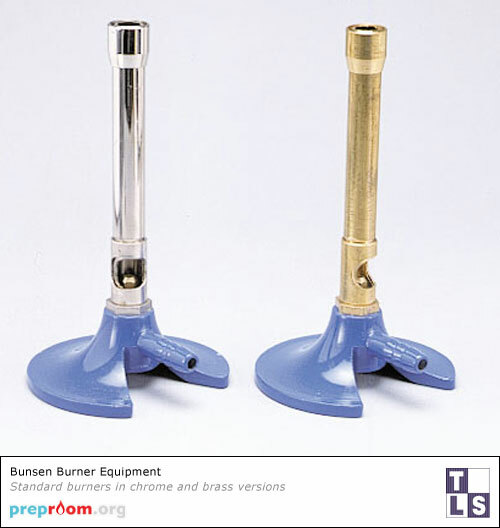 Bunsen burners should be checked periodically for damage and build up of soot or burnt on grime. The barrels can usually be unscrewed and removed to reveal the gas valve. This should be clear of obstruction and can be cleaned gently with a pin. Sometimes specks of materials being heated will fall down the barrel and obstruct this jet which could lead to problems. Some models have adjustable needle valves which can adjust the gas flow rate. These should be cleaned and lubricated to make sure they do not stick. The collars can be removed and cleaned to ensure they can be adjusted smoothly and grime can be removed from the barrel with a wire brush. The Bunsen tubing should be replaced if the rubber starts to degrade by becoming hard or brittle or if cracks or holes appear anywhere along its length. Different models of burner may have different size hose barbs (the gas inlet connector) so make sure any replacement tubing fits tightly on this so no gas can escape. Many lab suppliers sell pre cut lengths of Bunsen tubing which is specially designed for this purpose making it more flexible and durable.